Collapse begins when real reform becomes impossible. We all know why reforms fail: everyone whose share of the power and money is being crimped by reforms fights back with everything they've got. Reforms that can't be stopped by the outright purchase of politicos are watered down in committee, and loopholes wide enough for jumbo-jets of cash to fly through are inserted. The reform quickly becomes "reform"--a simulacrum that maintains the facade of fixing what's broken while maintaining the Status Quo. Another layer of costly bureaucracy is added, along with hundreds or thousands of pages of additional regulations, all of which add cost and friction without actually solving what was broken. The added friction increases the system's operating costs at multiple levels. Practitioners must stop doing actual work to fill out forms that are filed and forgotten; lobbyists milk the system to eradicate any tiny reductions in the flow of swag; attorneys probe the new regulations for weaknesses with lawsuits, and the enforcing agencies add staff to issue fines. None of this actually fixes what was broken; all these fake-reforms add costs and reduce whatever efficiencies kept the system afloat. Recent examples include the banking regulations passed in the wake of the 2008 meltdown and the ObamaCare Affordable Care Act (ACA). 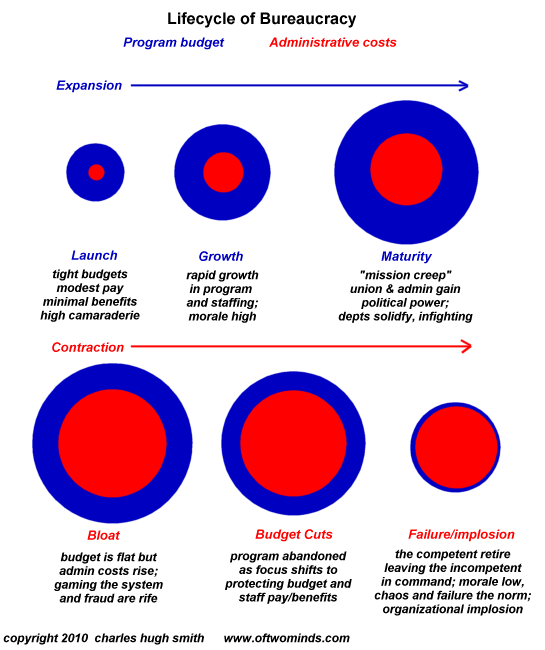 Back in 2010 I prepared this chart of The Lifecycle of Bureaucracy: as bureaucracies expand, they inevitably become less accountable, less efficient, more bloated with legacy staffing and requirements that no longer make sense, etc. As costs soar, the bureaucracy's budget is attacked, and the agency circles the wagons and focuses on lobbying politicos and the public to leave the budget untouched. Since accountability has been dissipated, management becomes increasingly incompetent and larded with people who can't be fired so they were kicked upstairs. Staff morale plummets as the competent quit/transfer out in disgust, leaving the least productive and those clinging on in order to retire with generous government benefits. In this state of terminal decline, the agency's original function is no longer performed adequately and the system implodes from the dead weight of its high costs, lack of accountability, gross incompetence, inability to adapt and staggering inefficiency. This generates a ratchet effect, where costs increase even as the bureaucracy's output declines. The ratchet effect can also be visualized as a rising wedge, in which costs and inefficiencies continue rising until any slight decrease in funding collapses the organization. The net result of the Ratchet Effect and the impossibility of reform is this: it's cheaper and more effective to let the system collapse than squander time and treasure attempting reforms that are bound to fail as vested interests will fight to the death to retain every shred of power and swag. Since the constituent parts refuse to accept any real reforms, the entire system implodes. We can look at healthcare, higher education and the National Security State as trillion-dollar examples of systems that become increasingly costly even as their performance declines or falls off the cliff. This is the lesson of history, as described in the seminal book The Upside of Down: Catastrophe, Creativity, and the Renewal of Civilization. Collapse does not need to be complete or sudden. Collapse tends to be a process, not an event. Collapse begins when you can't find any doctors willing to accept Medicaid payments, when the potholes don't get filled even when voters approve millions of dollars in new taxes, and when kids aren't learning anything remotely useful or practical despite the school board raising tens of millions of dollars in additional property taxes. Thank you, Daniel G. ($5/month), for renewing your superbly generous subscription to this site -- I am greatly honored by your steadfast support and readership. Thank you, Mark J. ($10/month), for your outrageously generous subscription to this site -- I am greatly honored by your support and readership.